A word on this page. Shadow was the first person I'd heard of who was building his own arcade controls. He was good enough to pass on to anyone who asked an email with details on how he did it. He has given me permission to repost it here. Thanks Shadow! Well, I'm including a couple pictures (I hope you can view them) that might help a little on how this controller works. One is a color photo of the keyboard interface. It shows the front side of the keyboard mainboard attached to a piece of wood along with the connector strip. On the back side of this mainboard is a strip that looks like the traces on the edge of a PCI card. This strip is where the 30 wires from the ribbon cable attach. I don't know if you have ever been into a modern keyboard, so I will try to give you a quick take on it. Note: There is no standardization for the Way the matrix is laid out. One brand of keyboard may be totally different from another even though they use the same IO chip. As the caps lock, num lock, and scroll lock LED's are powered by +5 volts it is important to not connect those lines to the buffer as this will permanently damage your motherboard. I used a keytronics keyboard for this project. If you use another brand of keyboard you will need to trace the matrix out yourself. Not a hard process but it will take a little time. You'll defiantly understand it better afterwards. The mainboard you see in this picture connects to 2 pieces of mylar. The mylar has traces and pads on it that look like the surface of a printed circuit board. Each of the 30 traces (15 each piece) passes through several pads on the mylar. This is what makes up the matrix. Without the matrix each key would need two wires ran to it creating a huge mass of spaghetti. All the pads on one piece of mylar line up with the pads on the other piece, so that when the key above it is pressed it mashes the pads together and makes a contact/closes a circuit. Okay, now remember that each trace passes through several pads. for example lets look at traces 5 & 10. Trace 5 is on the bottom sheet of mylar and it starts out at the pad for the F6 key. It then goes on to F5, F4, ESC, G, H, ', "up arrow", 0, and period on the number pad. 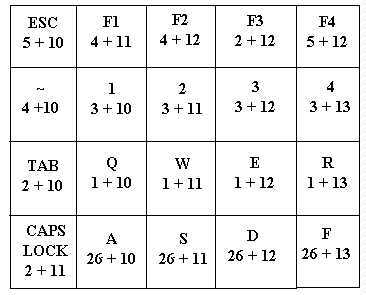 Trace 10 on the top sheet starts at ESC, 1, ~, TAB, Q, A, then Z. Now if you look at the second picture this is part of my matrix map, (I tried to get it all in the scan but it makes too bit of a file) you will notice that the only place on the matrix that trace 5 and trace 10 cross is the ESC key. So, let's say we want to rig our "reset" button so that it will "escape" out of a game back to the menu. All we need do is wire the 2 wires from that button to the connector block on connector 5 and 10. Now every time you press this "reset" button it's just like pressing ESC. That's it you just wire buttons and joysticks to whatever keys you want like 4 and 11 for F1 or 4 and 8 for the left CTRL key. IT's best if you map both the ESC key and the CTRL keys but not both to player keys. I have CTRL mapped to player one fire and ESC mapped to the reset button. This way it's not likely that they will both be pressed at the same time by accident. You want these to keys because when it comes time to shut down your machine you either have to have a mouse,(remember I'm using a track mouse, but not wiring the buttons to anything since all the Mame mouse games let you map keys for fire) or a keyboard attached. What keys on the keyboard do you toggle to get the start menu? CTRL/ESC (Fire button/reset). As for the coin slots I using a real arcade coin door complete with coin switches. The coin switches are just little switches with a piece of wire attached to them that the coin hits as it slide down the slot. When it hits the wire it momentarily closes the circuit, just like the fire buttons do. Wiring them to the 3 and 4 keys, (Don't forget some emu's like System 16 require player 2 to be started with a separate coin button) Was as simple as connecting the coins switches to 3 & 12, and 3 & 13! As I said some games like Centipede have a little problem with the coin insertion, but I figure I might hide a small button someplace handy that can be used to insert a coin for those problem games. I just think that the idea of having to put in quarters adds to the nostalgia.